For the past ten years that this site has been providing support and ideas, I've been amazed by the wonderfully various contexts and settings in which Hot Potatoes is used. And while people have been coming and going, I'd like to preserve some of the knowledge in the hope that new users will have access to other peoples' experiences and good practices. 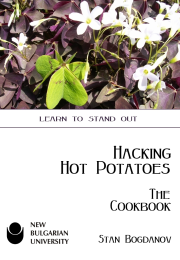 I'm going to feature a series of interviews called Ethnography of HotPotatoes starting with Alan Hess, an EFL teacher in Switzerland who is sharing his 'stories4learning' based on HotPotatoes and JMix in particular, and who has taken a pedagogical approach to hacking HotPotatoes. Welcome, Alan. Alan: I'm a former IT specialist who originally trained as a music teacher but first side stepped into teaching just 12 years ago. I'm now just about to retire. I'm British by birth but half Polish and I now live and work in Switzerland. Although employed as a music teacher primarily, I'm required to teach English as an additional language purely because I'm a native speaker. This prompted me to complete a Masters Degree in Applied Linguistics with the Open University which also influenced my teaching style to a large degree. 2. Tell us about your students. What students do you teach? 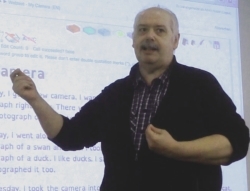 Alan: I work in a small special school near Zurich for learners with learning difficulties and/or behavioural issues. They are generally of normal intelligence and are a mix of Swiss parentage, mixed and those with a migration background. They follow a Swiss county curriculum as far as possible to allow reintegration in mainstream schooling, although we are free to adapt materials and approach as we see fit. We work closely with the local education authority, school psychology service and county councils, who ultimately decide which children should attend our school. We are indeed often able to reintegrate learners in mainstream schools and work with many other schools to allow this. Those learners who remain with us can often find a suitable apprenticeship with our assistance. 3. Do you apply any (and what) special pedagogy related to the nature of your students' difficulties/impairments? 4. How do you adapt/hack into HotPotatoes to cater for these SEN learners' needs to support their learning? 5. Do you use any other general purpose or specific educational software? Alan: We use other Hot Potatoes components such as JQuiz, JCross etc. within the Moodle learning platform as HotPot tests are simpler for our learners to operate and understand in comparison to the Moodle built in quizzes. We have an excellent Mac based school infrastructure and are able to use a good selection of online materials at will. We can also run Windows apps within virtual machines on all our iMacs. 6. What kind of commitment is needed for your web site and what motivates you to keep developing these exercises and your software? Alan: I have until recently supported the school infrastructure personally but as I will soon retire, we have employed a local IT firm to handle support. The school will continue to use S4L and I will spend much more time developing it in my increased free time. The code was written very hurriedly primarily for my own use until now and retirement will allow me to also track the other users of my software around the world, of which the number is now increasing. I even have a user in a RTL language, Hebrew! In the meantime I have made many friends in the Functional Grammar community world wide and will continue to promote the use of ICT within this framework. There are sadly few others who offer software based on this approach at the moment. 7. What free sites would you recommend for teachers of SEN students using ICT? Alan, thank you for agreeing to share your 'stories 4 learning'. Good luck and happy hacking! 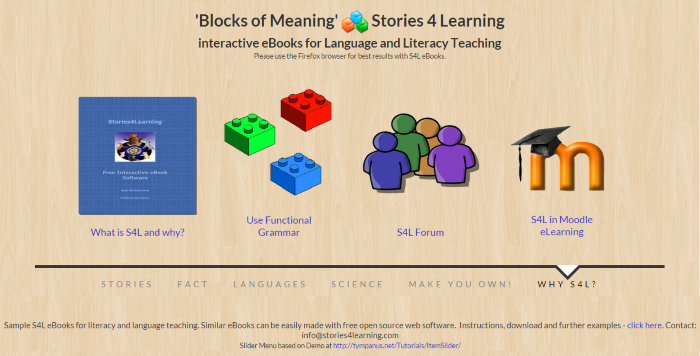 The stories4learning eBooks use OpenDyslexic ☍, a free and open source Dyslexia typeface created to increase readability for readers with dyslexia. The typeface includes regular, bold, italic, and bold-italic styles. It is being updated continually and improved based on input from dyslexic users. There are no restrictions on using OpenDyslexic outside of attribution.